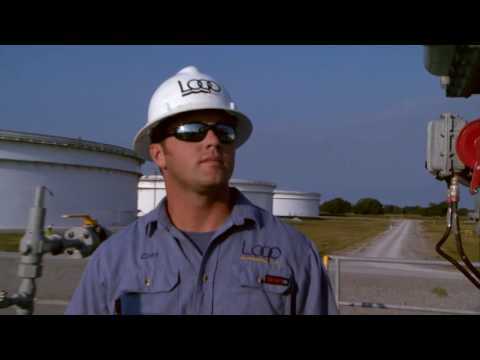 LOOP owns and operates 22 state-of-the-art above-ground tanks. Each tank has a floating roof and an efficient "drain dry" bottom. Fifteen of the LOOP tanks are 50 feet (15 m) in height and 315 feet (95 m) in diameter. Each tank holds up to 600,000 barrels (95,000 m3) of crude oil. Recent construction expanded the tank facility to approximately 12 million barrels (1.91 million m3) of crude oil storage capacity. The seven new tanks are 50 feet (15 m) in height and 243 feet (74 m) in diameter. Each new tank can hold up to 375,000 barrels (59,000 m3) of crude oil. LOOP has the space and flexibility to build additional tanks of various sizes on adjacent tracts of land. Above ground tanks make it possible to segregate specialty grades of crude oil for our customers. Customers with unique requirements can isolate their supplies and protect the quality specifications of the crude oil sent to refineries. The tanks have floating roofs and efficient bottoms, allowing them to be emptied and handle varying grades of crude oil.